The changes introduced with effect from January 2016 effectively cap the level of deployment for each eligible technology under the feed-in tariffs. 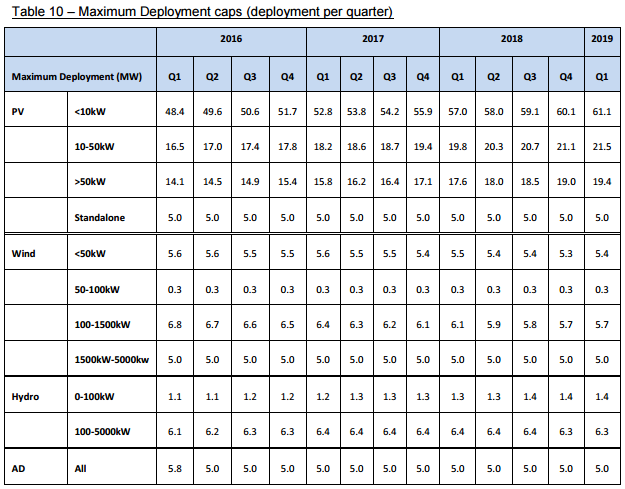 The government added deployment caps to the feed-in tariff mechanism from 2016 to keep annual expenditure below £100m. The caps will have the effect of significantly inhibiting installations of new renewable energy systems under the Feed-in Tariffs. As illustrated here, these caps would reduce deployment to about half the average level over the years 2012 to 2015. If the following deployment caps are reached, any further installations in the quarter will be held over for registration in the following quarter. This would also trigger contingent degression as described here.